New book focuses on twelve Washington politicians who, addicted to power, compromised national security to satisfy their addiction. To get power, to increase power and to hold on to power is the focus of "Homeland Insecurity," a study of how some Washington politicians, addicted to the acquisition of power, compromised national security in order to satisfy their addiction by undermining the investigatory authority of the FBI. 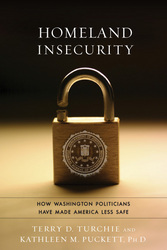 Tracing the activities of twelve elected officials and a select number of appointees from Watergate of the 1960's to the present time, the authors, Terry D. Turchie and Dr. Kathleen Puckett, both formerly of the FBI, have, in case-like fashion with documented support, brought illumination to the ruinous role that the addiction to power has had on shaping the nation's security structure. "Some politicians are literally addicted to the perks and pleasures of power," says co-author Dr. Kathleen Puckett, a clinical psychologist and a founder of the FBI's Behavioral Analysis Program. "The political culture of Washington D.C. operates on the principle that power enables privilege just as the royal courts of Europe functioned. Privilege shared creates its own favored class exempt from legal and social rules that govern other citizens. To be a member of this class creates a feeling so good that the pleasure centers of the brain are activated and the process of addiction to power and privilege begins. In Homeland Insecurity we focus on those individuals who have apparently been addicted and acted to serve that addiction to the detriment of our nation's security structure." Terry Turchie and Dr. Kathleen Puckett are the award winning co-authors of "Hunting The American Terrorist,"the behind- the- scenes story of the capture of Ted Kaczynski, the infamous Unabomber. Prior to that, they had distinguished careers in the FBI. Terry D. Turchie was a former Deputy Assistant Director of the Counterterrorism Division of the FBI. He was the Unit Director of the force that captured Theodore Kaczynski and directed the Southeast Bomb Task Force that drove Eric Rudolph into a five -year isolation in a North Carolina forest prior to his capture by a local law enforcement officer. He subsequently accompanied FBI Director Louis Freeh to Pakistan and other countries in pursuit of Osama Bin Laden prior to September 11th. He is the recipient of the FBI Director's Award as well as one of the very few recipients of the Attorney General's Award for Distinguished Service in both counter-intelligence and counter-terrorism. Dr. Kathleen M. Puckett spent 23 years as an FBI Special Agent, where she was primarily involved in the investigation and analysis of cases involving foreign counterintelligence and domestic and international terrorism. She was a founding member of the FBI National Security Division's Behavioral Analysis Program (BAP), and provided ongoing behavioral consultation to numerous high profile counterintelligence and counterterrorism investigations throughout the United States. "Homeland Insecurity"( 9781933909332) History Publishing Company , September 25, 2008, will be in bookstores nationally. Review copies will be available to accredited members of the media.